After an accident in a brilliant young physicist's most ambitious experiment, it appears: a wondrous sphere the size of a basketball, made of nothing known to science. Before long, it will be clear that this object has opened a vista on an entirely different universe, a newborn cosmos whose existence will rock this world and test one woman to the limit: the physicist who has ignited this thrilling adventure. Only the author of the landmark novel Timescape could so plausibly take the reader behind the scenes of major scientific research, so boldly speculate about the consequences of paradigm-shifting discovery, and so vividly capture the intense human drama as the forces of academia, government, theology, and the mass media battle for control of a mysterious new reality. 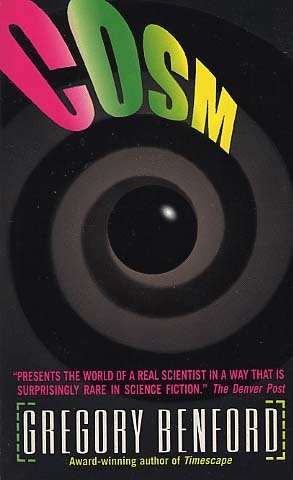 COSM is Gregory Benford at his provocative best, exploring ideas at the frontier of mankind's understanding, and posing profound questions about Creation, human destiny, and the riddle of godhood.